Re-potting my succulents and cacti was not as easy as I thought it was going be. I had a few that I had neglected for years waiting for just the right planter to put them in. They were a sad little group for sure. I figured that I’d have them re-potted in 20 minutes or so and would finally be proud of the little group. 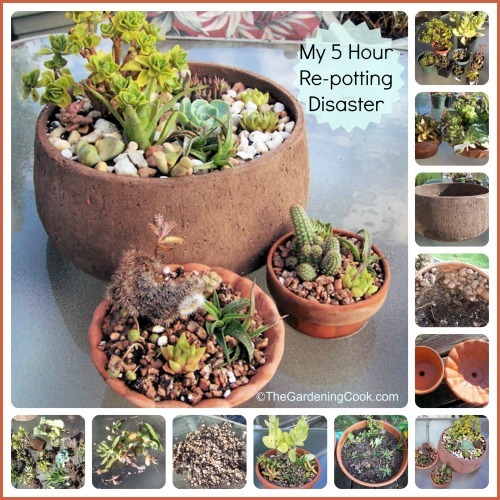 Re-potting Succulents and Cacti Took me all Afternoon. But you know what? Sometimes a 20 minute task can end up taking all day for reasons you would never imagine when you started. I had a sorry little group here. Some of them had lost most of their soil. 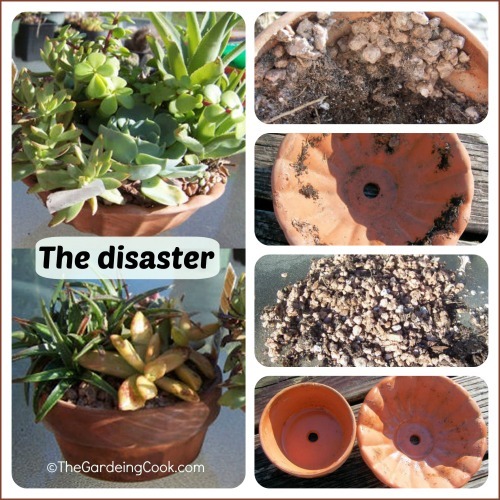 Most were dried out and shriveled. But I am an optimist and thought I’d be able to bring them back to life. 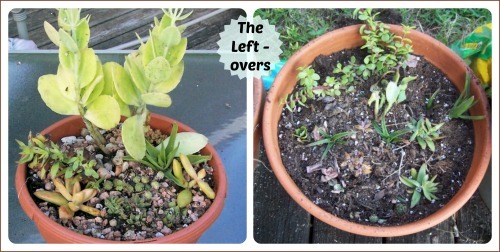 The first thing I needed to do was remove the plants from the two small terracotta planters. Easy right? Think again. Some “intelligent” design person who made the two planters decided that they did not want the rocks and stones to fall of the planter on the trip in Lowe’s delivery truck. Their great idea? Glue the rocks in place. All I can say is, this was an effective plan as long as you never want to water the plants or remove them from the planter! It took me at least three hours to remove the darn things, cursing the whole while. I am thankful that I only paid $5 for each planter. I pity the poor customers who paid the original price of $19.99 for them and then wondered why the watered ended up flowing off the rocks and resulted in dead plants. I also wonder if my hands will ever be the same after trying to remove those rocks! 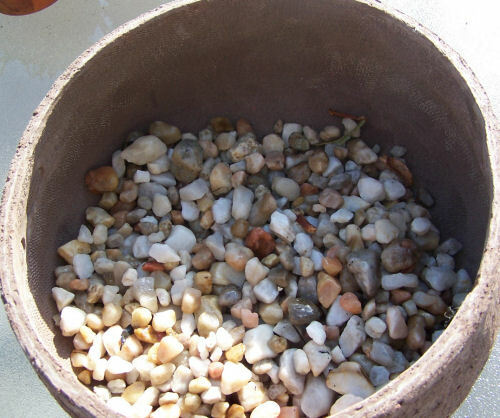 I used river rocks in the bottom of my planter for drainage. I also did the same for the two small terracotta post that were now finally rid of the rocks and cleaned. 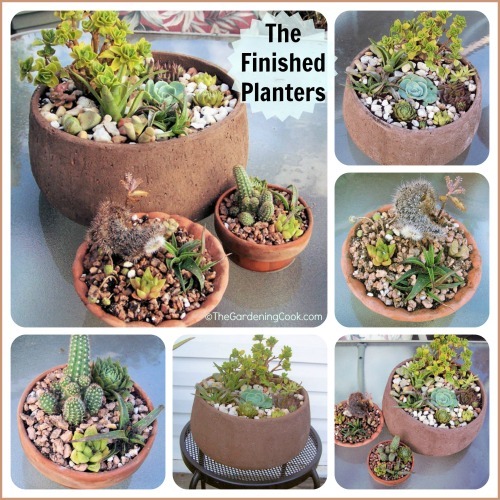 The end result – a large planter and two small terracotta pots. Not bad for almost a whole day’s work it is? 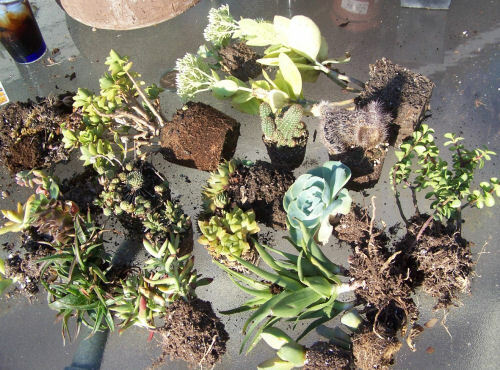 I even ended up with some remnants of pieces for propagation, and some that did not fit into the three planters. They are now sitting on the edge of my deck in some big pots to use later for another “short little re-potting exercise.” Hopefully, the next one won’t take all day. Moral of the story. If you buy planters with rocks on the tops from Lowe’s be sure the rocks are not glued on to the soil! And if they are, even $5 is not a bargain. It’s never crossed my mind to see if the rocks are glue together. Silly me assumes no one would glue them. Thanks for sharing your experience so that I know to check before buying! Hi Mary Ann. 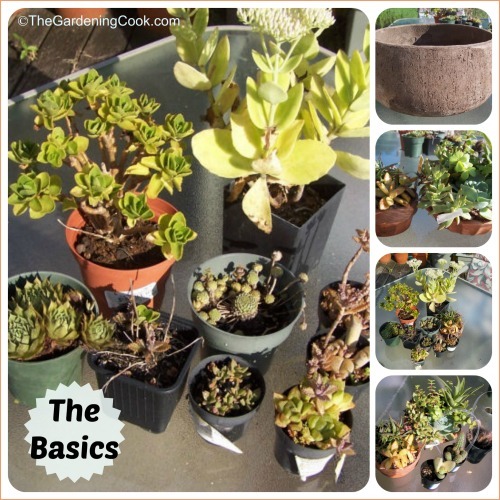 An all purpose cactus potting soil is perfect for succulents. It allows for good drainage. 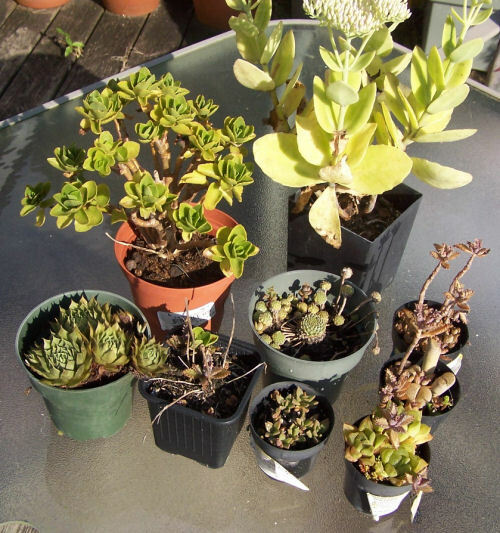 You are lucky in zone 9, almost all of the succulents will over winter outdoors. I have to bring mine in. Just choose the ones you like the look of. They are very easy to grow.